It was raining again in the morning; no surprise, Scotland being famous for wet weather. 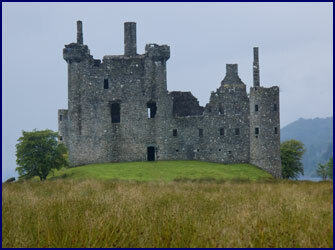 After breakfast we headed back to Loch Awe to see if we could find a way into Kilchurn Castle. We drove around to the opposite side of the loch from the night before, and found a small lane that seemed to head in the right direction. It led us to a path, marked with a hand-made sign that said �to castle.� Following this, we crossed under the railroad trestle and across a wide flat field beside the loch to the castle. It was a magnificent ruin, and nicely restored. The rain was falling softly on us as we moved among the different rooms and chambers, the roof long since gone. 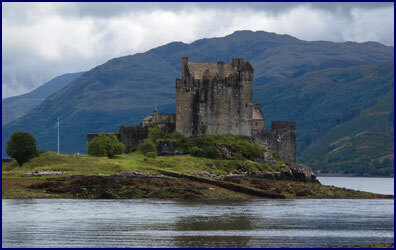 Surrounded on three sides by water, Kilchurn Castle was situated to be defendable. We climbed the spiral stairs to a high tower and looked down over the loch and the fields below, imagining how it would have felt to stand there in 1450, watching enemies approaching the stronghold. 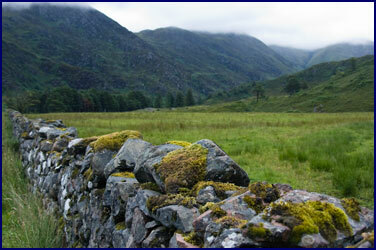 We drove the single lane road through the Caledonian Forest of Glen Orchy. It was a beautiful valley, the road lined with ferns and birch trees; many of the larger trees were draped with hanging moss. The river was very swift with white water as it cascaded down the glen. We parked on a small bridge to take some photos of an impressive waterfall beside the road, but the stop was brief because it was raining really hard by then. I almost lost my lens cap to the river gods. We stopped in the towncenter of Fort William around noon to exchange some money, but the bank was out of cash and said they couldn�t help us - so they sent us to the Post Office, which was able to change our currency with no problem. Go figure. We stopped at a bakery and picked up some pastries for dinner later. Following directions from our friend at the B&B, we drove down through Glen Garry on a narrow one lane road. The rain cleared out and blue sky was showed through patches of cloud. 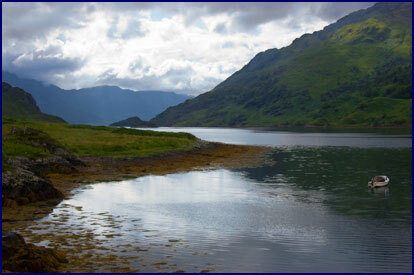 The scenery was impressive, with dramatic mountains rising above the glistening lochs. We stopped at a scenic overlook where visitors had stacked rocks to make small cairns; there must have been five hundred of these little monuments on that hilltop. 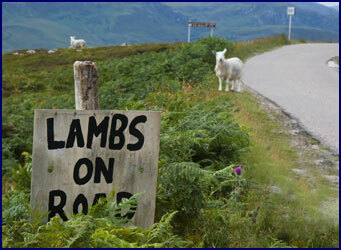 Jineen and I like to take the smallest roads on the map, and Scotland has plenty of these. Though most were paved instead of gravel, some of them were extremely narrow, and on the less traveled routes the passing places can be few and far between. 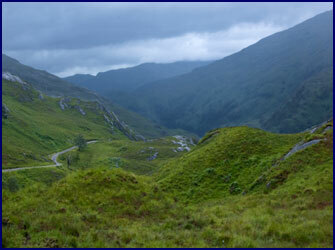 The route we took from Glen Garry past Loch Quoich was such a road. The farther we went the smaller the road became. We hadn�t seen anyone for miles, or indeed, hardly any signs of civilization at all. A strip of moss down the center of the tiny road indicated its infrequent use. The passing places were very scarce; I couldn�t imagine how we would back up if we met another car - but fortunately the area was so remote that this seemed unlikely. As we descended into the final valley, the road was so steep it was hair-raising; tight switch-back turns crossed over narrow stone bridges, our small rental car barely fitting between the intrusive stone walls. If we met another car here we were in trouble - but surely few others would brave this treacherous route. Clutching the steering wheel tensely, I finally negotiated the last of the hairpin turns to get to the bottom, where we came around a bend to find . . . a tearoom! Only in Scotland. It turned out that there was indeed a tiny town called Kinloch Hourn at the end of the road, right on the shore of Loch Hourn. It consisted of one farm, several houses, a small carpark, a couple of short jetties, and of course, the tearoom. We walked along beside the tidal Loch Hourn, the swift-moving clouds hinting of rain to come, and shafts of late afternoon sunlight setting the water aglow in silver. The trail followed the water�s edge, with a small stone retaining wall protecting the shoreline at high tide. Fat black slugs were all along the path; we had to keep a sharp eye out to avoiding stepping on them. 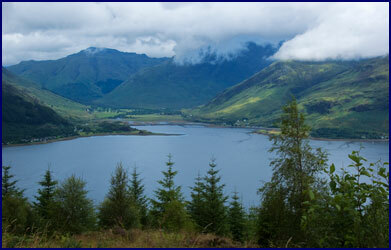 Before long the trail climbed along the hillside overlooking the loch. We passed above the Skiary B&B, a small house right by the water offering lodging for hikers; there are no roads to it, so the only access is by hiking in, or by dinghy. 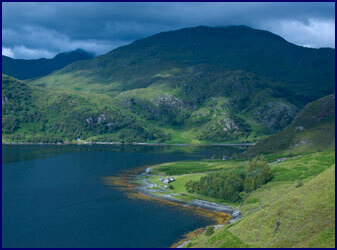 After a while we came to the top of a large hill, with a fabulous view of Loch Hourn and the surrounding mountains. The sun broke free of the clouds and illuminated the shoreline in golden light. We sat for a while, enjoying the afternoon, before heading back. As we descended the hill, great black storm clouds could be seen moving in behind us; we were expecting a real soaking, but managed to make it back to the car with just a shower. We met a Dutchman and his son in the parking lot and got some tips on places to go; these were the first people we had seen all afternoon. On our way back towards Invergarry, we stopped to have happy hour on a knoll overlooking Loch Quoich. It was well after nine o�clock, but it was not yet fully dark, for summer days are long so far north. 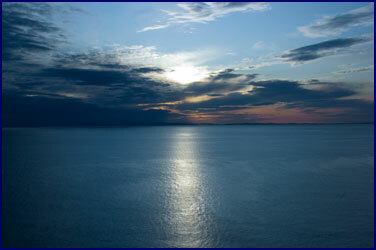 Brilliant shafts of light from the setting sun accented the dark clouds and reflected off the water. We dined on the bakery pasties and cookies, accompanied by an excellent South African white wine. We watched the surface of the water carefully; Loch Ness is not the only one in Scotland said to have monsters, and while Nessie has gotten the most publicity, there have been reports of similar sightings in many of the other lochs. This seemed like just the time and place to see such a creature, but alas, no signs of head or humps broke the surface of the glistening water. When we passed through Invergarry earlier in the day, we had found a room at a nice B&B with amazing flower gardens and a friendly poodle. 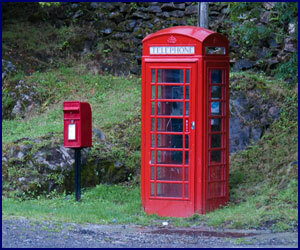 On the way back to our lodging, we stopped at a phone booth to call home. It was one of those old-fashioned ones, bright red and big enough for Superman to change his clothes in - which was just as well, because within minutes Jineen and I both had to squeeze in and pull the heavy door closed to escape the clouds of bloodthirsty midges that come out in hordes at dusk. In the morning we went to check out the Invergarry Castle, which was next to the driveway of a grand hotel. 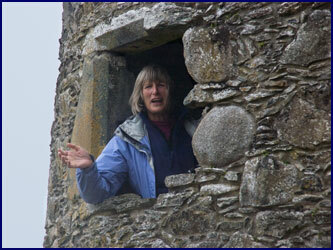 We couldn�t get in to the castle because it was in the process of being restored, but we peered at it through the fence. We followed a small path behind it that led to a little wrought iron metal gate, which opened into a secret garden, hidden behind the old castle garden wall. 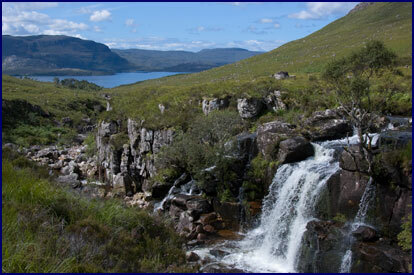 We looked back to panoramic views of Loch Garry as we headed west and north. Rain fell intermittently, occasionally turning to a downpour. 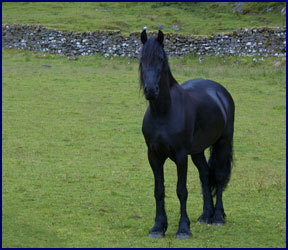 We stopped at Shiel Bridge, where we saw Highland ponies and a black Friesian in the pasture at a pony trekking center. We drove the single track road over a steep mountain pass, which was heavily forested and very misty. We stopped at several really superb scenic overlooks; the fog rolling in made the views surreal. The hairpin turns kept our attention, and further on there were cattleguards and sheep in the road. When we got to the other side of the pass, the rain stopped and the sun came out. This seemed to be a pattern; rain in the morning, then clearing off to what the weatherman on the radio called �sun and shadows,� a mix of blue skies and stormy clouds, with occasional rain showers that can come up very suddenly and end just as quickly. 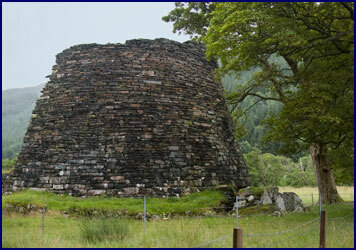 We passed through the town of Glenelg, beside the bay, and continued down a tiny road to the Dun Telve Broch. Found only in Scotland, brochs are the remains of circular Iron Age stone houses or fortresses, build over 2000 years ago. The sides consisted of inner and outer thick stone walls, with rough stairs in the space between them. 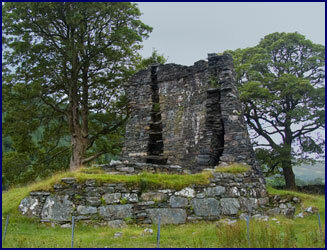 One side of the Dun Telve Broch was standing, maybe 35 feet high, and the other side had crumbled away. Huge old oak trees stood beside it, and sheep grazed nearby. We had the place entirely to ourselves. Standing on the broken wall of the ancient stronghold, we could look out across the pastures and see another, the Dun Troddan Broch. Nearby we also passed its modern counterpart, the Duntroddan House, set halfway into the ground and with a roof of sod, the grass on top growing high. 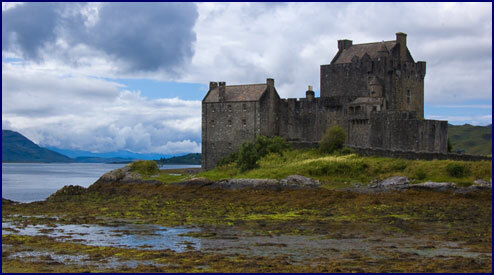 Continuing north, our next stop was the Eilean Donan Castle. Sitting on a promontory, surrounded on three sides by water, it is incredibly picturesque, like something out of a fairy tale. We photographed it from different angles, trying to hit the brief moments when the sun would come out. There were many tourists visiting so we didn�t go in, but we really enjoyed seeing this amazing Scottish icon. 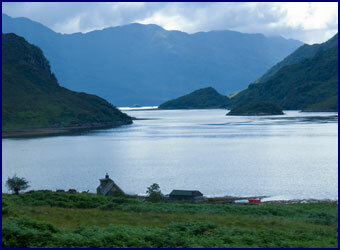 Next we came to the town of Lochcarron, a picturesque loch-side village. Since we were traveling without advance reservations, we had found that it was best to secure a room by late afternoon. Vacancies were a little scarce in Lochcarron, but after inquiring at several hotels and B&Bs, we were finally able to book into an excellent B&B up on the hillside, overlooking the town and the loch. 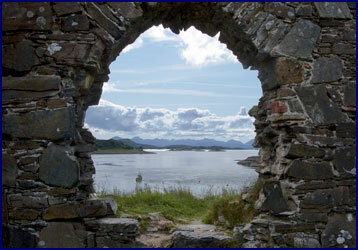 We drove down the glen to visit Strome Castle. 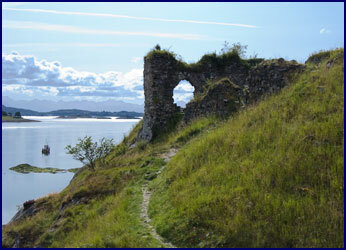 This old ruin sits on a cliff at the head of Loch Carron, near where it opens up into the Sound of Raasay. Once strategically important, this fortress was built in the 1400s, but now only a few walls remain standing. We stood by the parapet and looked out over the water. We watched several people walking along the edge of the firth, picking something out of the seaweed left above the waterline at low tide. We were able to talk to one guy when he came past; we learned he was collecting snails, and he had a whole sack full. He told us they are called winkles, and he sells them to restaurants. Driving back towards Lochcarron, we noticed a trailhead by the road, and a small signpost that read �forest walk.� We parked and followed the path up through the dark forest. 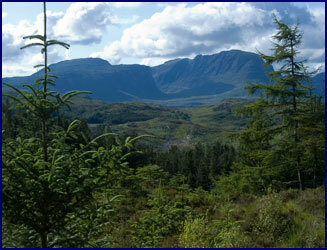 Scotland has many large forests that are planted and harvested for timber. 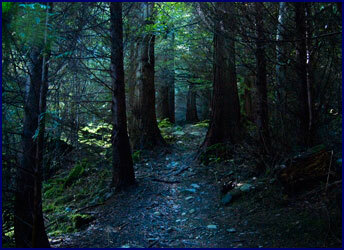 The evergreen trees are planted close together, and they grow very tall and straight. Because the trees are so dense, little light gets through to the forest floor; from the outside, it appears very dark, almost black, underneath the trees. Ever since I had visited Scotland for Thirlestane Castle back in 1997, I had been intrigued by the thought of going into one of these shadowy woods. The path led us up the ridge, and it was indeed very dark under the trees, and sort of mysterious. There was hardly any underbrush, but the forest floor was covered in a deep spongy moss. Every so often there would be a place where a shaft of sunlight broke through the dense trees, illuminating a circle of moss-covered rocks, giving it a magical feel. It seemed a good place for faeries. At the top of the ridge the trail came out into the open, with a good view of the valley and mountains beyond. 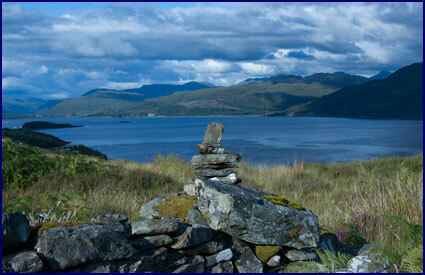 Next we hiked to Stromemeanach, a long-abandoned settlement that sits high on a ridge overlooking Loch Carron. We walked up through a patch of forest, and then followed the small path through the high grass and heather as it traversed the ridge. At the top we found the remains of a dozen stone cottages and buildings. We learned from a pamphlet borrowed from our B&B that the village was last inhabited in 1907 - it was pretty much wiped out by typhoid. Jineen thought she found the skull of a dead typhoid baby, but it was only a lamb. It was a beautiful evening, with a brisk wind blowing the grass and swift clouds racing across the blue sky. The light was dramatic, making everything glow in vivid detail. 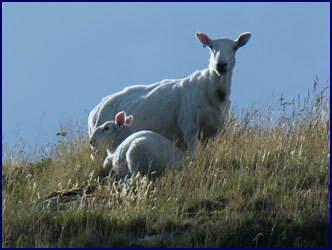 We watched a sheep and her lamb, silhouetted against the skyline. We explored the village ruins, enjoying the long daylight hours. We went back to Lochcarron and had dinner at the Rockvilla Pub, right by the water. Then back to the B&B, where we ate cookies and finished the South African wine. We looked down on the loch in the gathering twilight, watching in vain for a sea creature. We awoke to a beautiful sunny day for once, with not a rain cloud in sight. 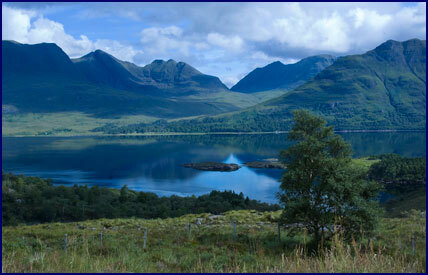 We drove north past Loch Shieldaig, and on to Torridon. The mountains were very rugged, and there were sheep lying in the road everywhere. We came to the Beinn Eighe National Nature Reserve and stopped at an overlook at the Upper Loch Torridon, admiring the mighty mountain Beinn Alligin across the water. Bryan (at the B&B the first morning) had told us to hike at Torridon, and all of his advice so far had been good. We parked in a small lot by a waterfall and took the trail to Coire Dubh. The path followed a stream up through a light forest and out across the rocky mountainside, climbing gently but steadily towards the large peaks looming before us. As we went higher, we could look back and glimpse the sea behind us in the distance. We passed half a dozen waterfalls, and twice we crossed over the stream on a small footbridge. There were several forks in the trail; we kept bearing toward the left � perhaps we will come back another time and take the right hand path. We met a Munro Bagger. A Munro is a Scottish mountain that exceeds 914 meters in height, and a Munro Bagger is a climber who is dedicated to reaching the summits of every Munro in Scotland, often to the exclusion of all else. 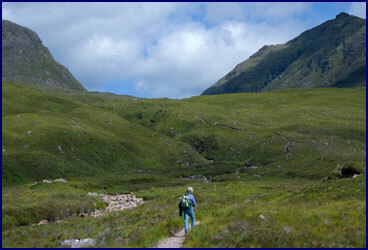 The young man who passed us in pursuit of the two Munro peaks of Benn Alligin appeared very fit and somewhat obsessed. It was the most fabulous day. The weather was perfect, and there were incredible views in all directions. 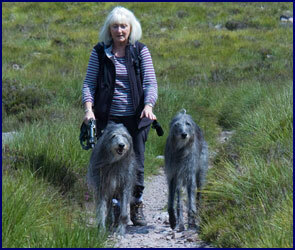 We met a nice Scottish lady out walking with two huge dogs; they were Scottish deerhound lurchers, quite beautiful and very friendly. We continued on up the base of the mountain. A steep rocky cliff towered above us; looking up, we could see two tiny figures on the top of the peak � more Munro Baggers no doubt � we watched as they ascended down the treacherous slope. Eventually the path we were on petered out to nothing; we continued on for a while, picking our way over the rocks, around the shoulders of Beinn Alligin. There were very few birds, and the only wildlife we saw was one little toad. We sat on a rock outcropping and ate lunch. 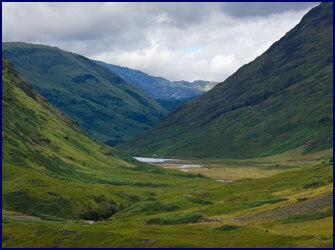 The broad valley stretched before us, the stream a winding silver ribbon down to a loch far below. We were surrounded by impressive peaks, and we could just barely see the blue line of the ocean on the horizon. It was very quiet - the only thing we could hear was the wind. It was incredibly serene and peaceful, almost as if we had traveled back in time. There are certain golden moments that live on forever in ones memory, experiences so perfect that even many years later, you can pull out that moment in time and recall the mood of it. The serenity and beauty of that day has been added to my collection of such memories. Eventually it was time to head back, not without a little regret. We found our way back to the path and headed down the mountainside. Looking behind us, we realized that the cliff top where we had seen the two climbers was not really the summit of the Munro after all; from further away we could see three more ascending peaks behind it. We returned to the car park tired and happy, almost five hours after we had left it. Jineen and I agreed that it had been an exceptional hike and a glorious day. 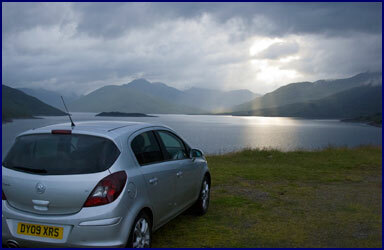 We drove north, following the Wester Ross Coastal Way. It was a heavily trafficked single lane road with passing places, which made it very difficult to drive in any sort of rhythm; we constantly had to stop or back up to let an oncoming car pass. There were signs stating, �Lambs in Road,� and sure enough, we had to dodge sheep frequently. We have often seen them before on really small roads with little traffic, but we were surprised at the number of sheep on this heavily traveled throughway. They had little sense of yielding the right of way, and they did not always look both ways before crossing. We were unable to find a B&B vacancy in the beach resort town of Gairloch, so we drove on to the small town of Poolewe, where we got the last room in a little B&B called Craigdhu. We phoned home from another of those sturdy red Superman phonebooths. 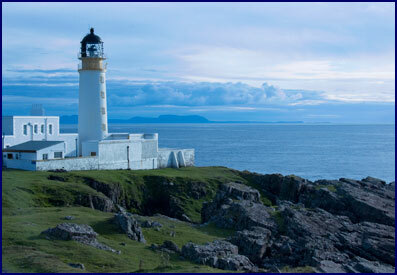 It was a beautiful evening, so we drove out the long lonely road to the Rua Reidh Lighthouse and hostel. The impossibly narrow single track road clung to the edge of the cliff, looking down on the sea far below. Sheep darted in front of the car, and seagulls cried overhead. The twisty little lane plunged down into steep gullies by way of hairpin turns, before crossing narrow bridges of dubious navigability. We considered ourselves lucky to meet no other cars, as the frequency of passing places was highly inadequate. The Rua Reidh Lighthouse stood at the end of the road on a rocky point. In addition to being a working lighthouse, there is a hostel and a nature center there. Signs in the nature display said that we might see whales, dolphins, sea eagles or otters from the point. We walked out past the lighthouse and followed a sheep path along the cliff. It felt a little like we had come to the end of the world; the land just ended abruptly into the sea. Waves were breaking furiously against the rocks, and birds nested on layered rock formations called sea stacks, just off the shore. We watched gulls diving for fish, but the whales, dolphins, sea eagles and otters did not appear. On our many travels, Jineen and I have adopted the custom of �Happy Hour,� where near the end of the day we find a beautiful spot and enjoy a small picnic. We drove back along the little road and found a secluded place to park at the top of a cliff, where we had a glass of wine while watching the sunset over the sea. The water was deep blue shot with gold, and the sky glowed with shades of orange. The evening was very quiet; we could hear nothing but the breeze and the faint sound of the surf far below us.